Before World War II, livestock flowed from west to east. The western meat packing industry only supplied local markets. Los Angeles did not have one major packing house until 1921. In 1920 the LA&SL's livestock business was inconsequential, averaging 4.2 total carloads daily (the UP proper hauled 62.5 loads daily in 1920). But as Los Angeles grew, so did the LA&SL's livestock business to Los Angeles, to 18.3 carloads per day in 1929, and 27.6 per day in 1939; nevertheless, the principal flow of livestock was still eastward. Up to one million head of cattle and two million sheep funneled into the Ogden and Salt Lake Union Stock Yards yearly, arriving from Idaho and Montana on the OSL, northern California and Nevada on the SP and WP, and Utah and southern Nevada on the LA&SL. Some were slaughtered by Cudahy in North Salt Lake and Swift & Co. in Ogden, but most were reloaded after resting and forwarded to Midwestern packing houses. In 1946-47 the traditional eastward flow of livestock through Utah reversed direction. Freed of wartime rationing, Californians demanded meat. By 1946 the LA&SL's average daily stock car count to Los Angeles had increased to 65.8 cars; however, the LA&SL was losing market share to truckers because its service was too slow. Train #299, the Night Live Stock, the LA&SL's fastest stock train, required 56 hours from Salt Lake City to Los Angeles, including a 10-hour stop at Las Vegas, where the livestock was fed, watered, and rested in pens (federal law restricts livestock to no more than 36 continuous hours in a car). Las Vegas's pens were also overtaxed by the increased business. With CTC nearing completion, and diesels on order, the UP decided it could run #299 from Salt Lake City to Los Angeles in under 36 hours. Test trains proved the concept, though the first, which left Salt Lake City on March 14, 1947, had to rest its stock in the pens at San Bernardino when it ran short on time. On March 21, 1947, #299 began running on a 32-hour schedule as the Day Live Stock (DLS), because it left Salt Lake City in daylight, whereas the Night Live Stock left at night. The DLS was a success; the Las Vegas pens closed by May 1947 and were torn down that fall. The DLS was assembled at North Yard in Salt Lake City. Its sheep and cattle mostly came from Idaho and Montana, via the SLX (Salt Lake Manifest), BUS (Butte Utah Stock), and PSX (Pocatello—South Manifest), which connected at Salt Lake City or at Ogden via a transfer arriving Salt Lake City two hours ahead of departure. Its hogs (up to 1.5 million a year in the 1950s) and some cattle were collected after resting at Laramie, Wyoming, by the ADP (Advance Denver Pacific) and the CLS (Coast Live Stock). All DLS livestock rested at Ogden or Salt Lake City. The UP blocked the DLS with a Santa Fe Barstow set-out (for the San Joaquin Valley); a Santa Fe San Bernardino set-out (for San Diego); an SP Colton set-out; and five blocks for Los Angeles (one for the Santa Fe). From September through December the DLS often ran in two to three 65- to 75-car sections; during the other three months priority fill was added to a maximum length of 85 cars at Salt Lake City. Some calves and sheep were backhauled from California. At 12:30 P.M. (as of April 1950) the DLS left Salt Lake City, paused at Las Vegas for a 45-minute inspection at 1:00 A.M., and arrived Los Angeles at 3:30 P.M., 28 hours later. 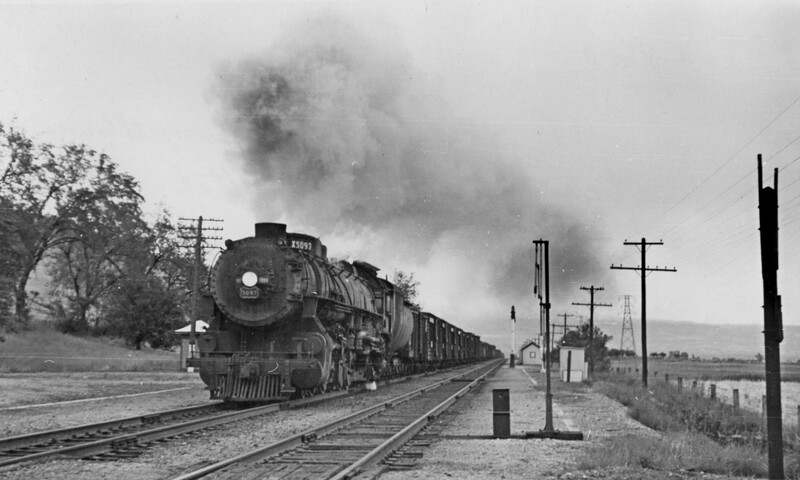 Fast by freight standards, with rights over all other freights, the DLS averaged 28 mph—not comparable to the City of Los Angeles, which averaged 55 mph westbound, nor even to the workhorse Pony Express, which averaged 35 mph (as of 1949), but vastly better than the old Night Live Stock. Despite the success of the DLS, during the 1960s UP's livestock business shrank. Better highways and trucks allowed packing houses to decentralize into the countryside adjacent to the feedlots, because it is cheaper to haul meat than the whole live animal. Truckers grabbed most of the longhaul meat business by hauling unregulated produce from California in refrigerated trailers and backhauling packaged meat and swinging carcasses. The Ogden Union Livestock Yards closed on January 31, 1971, as did the Swift & Co. packing house. By the mid-1970s UP's livestock business had dwindled to just one customer, Clougherty Packing Co. in Los Angeles, which received hogs from the Midwest (the West, lacking a large corn crop, has always looked to the Midwest for its supply of hogs). To retain Clougherty's business, the UP spent $1.2 million in 1976 to renovate 270 triple-deck hog cars and eliminated the rest stop at Salt Lake City by installing watering troughs inside the cars to allow in-car feeding and watering. To water the hogs and keep them cool in the summer the UP built a hog drenching and watering station at Dry Lake, Nevada; to keep the hogs warm in the winter the UP installed operable steel shutters on the cars' sides. These improvements allow the UP to haul hogs 1,800 miles without unloading. Accordingly, Salt Lake City Union Stockyards closed in 1976, its last employee moving to Dry Lake to run the drenching and watering station. The Day Live Stock and the Council Bluffs—Salt Lake City Coast Live Stock were merged into the California Live Stock by 1964. The California Live Stock was abolished in 1985. For a time the hogs went west on the CSLAZ (Canal Street-Chicago to Los Angeles Trailers). Now they take the NPLAGE (North Platte to Los Angeles GE), which hauls an average of ten stock cars daily (each with 200-230 hogs) along with General Electric appliances. It is the West's last regular livestock haul. Comments by Mark Hemphill, to a photo of a UP train passing northbound through Farmington, Utah, in October 1949; posted to Rails Through The Wasatch group on Facebook, December 30, 2018. I've done some thinking about the source material I used on the LA&SL book. I went through some USDA reports and some livestock market business journals when I developed that section to learn about the Utah slaughterhouse industry. None of them mentioned livestock moving eastward into the Salt Lake City and Ogden markets, but emphasized the source of cattle in those slaughterhouse markets as Idaho, Wyoming, and Montana, and source of hogs as the Midwest. Livestock grazed in southern Utah or Nevada would move into California for slaughter. In other words, livestock didn't try to run uphill against economics into the Salt Lake City and Ogden markets, or through those markets, in competition with the livestock that had a lower transportation charge. It's important to note that a lot of livestock throughout the US never went to a major slaughterhouse at all, but was slaughtered and consumed locally. It's possible those stockcars are loads, but I'd bet they're empties.